“Our campaign has had huge support from across the dwarfism community and has been officially endorsed by Little People of America – the world’s largest advocacy and social organisation for people with dwarfism. “At the time of issuing this statement we remain deeply concerned these shows are marketed as including ‘dwarf tossing’ and as having ‘sideshow appeal’. ‘Dwarf Wrestling’ is promoted on the basis of our bodies, just like we were in the side shows and freak shows of days past. “What happens when groups of average height people who’ve been drinking and watching dwarf wrestling in bars and nightclubs then encounter a young couple with dwarfism in the street outside? What happens to children with dwarfism whose peers in the school playground have watched this spectacle? Screenshots – taken at the time of issue – can be provided to journalists on request. 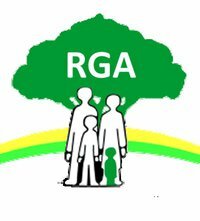 In light of new evidence, Chair of RGA UK, Gill Martin said: “We remain resolute in our belief that such events are primarily about encouraging audiences to laugh at people with dwarfism and the spectacle of violence against dwarf bodies as entertainment for average height people. 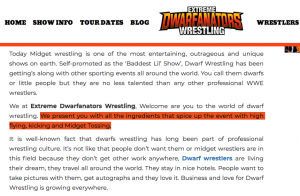 “We are deeply disappointed to see ‘Dwarfanators’ direct visitors to their website to call people with dwarfism ‘m*dgets’ – which is widely regarded as a highly offensive slur. “But our most serious concerns are about these shows openly admitting to ‘m*dget tossing’ – a brutal spectacle we believe encourages violence in real life. Studies with people with dwarfism showed 12% experienced physical violence. We believe such shows make the violence and abuse many in our community face more – not less – likely. “We’re well aware these individuals chose to participate in this spectacle. But their choice sustains an insidious stereotype affecting the rest of us and our ability to choose our own self-image and lead the type of lives we value. References to “m*dget tossing” can be found here and here. Please see screenshots below. In 2011 Martin Henderson was picked up and thrown to the floor by a stranger. The attack left him paralysed. Click here. Another screenshot from the Dwarfanators website. 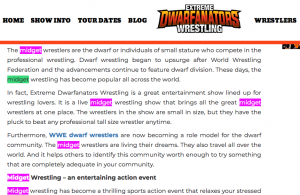 The word “m*dget” appears throughout the Dwarfanators’ website. “Such shows are rarely primarily about genuine athleticism and regulated competition; they’re about making people laugh at the Victorian spectacle of people with dwarfism fighting each other. “As most average height people meet few, if any, people with dwarfism in real life, such representations matter for they negatively inform people’s perceptions and behaviours towards the rest of our community – limiting our personal choice to shape our own lives and self-image. The word “m*dget” comes from the word midge or gnat, something you can squash with your thumb. It has strong historical associations with the Freak Shows of days gone by at which people with dwarfism were paraded and ridiculed. It is widely considered to be deeply offensive to most people in the dwarfism community. RGA UK is urgently calling on these venues to reconsider their decision to host these outdated events. You can help us. Contact the venues – tell them how you feel! October 18 2018 – Coyote Ugly Saloon, Cardiff UK. I am an average height person and I would not even dream of touching or abusing someone because of their physical appearance, whether it’s someone with dwarfism or otherwise. It’s troubling to read that people with dwarfism are subject to such abuse. It means there are a lot of nasty people out there that need to be educated and learn very basic manners. I am interested in this debate because both sides make very good points. As a libertarian, I naturally lean in favour of the people who want to wrestle. Could there be a compromise of some sort? For example, the wrestling events could be used as an opportunity to educate the audience about the abuse people with dwarfism are subject to.